Transfer by coach to a remote desert location with majestic views of Uluru to this incredible art installation by internationally acclaimed artist Bruce Munro. Enjoy a self-guided walk and see more than 50,000 slender stems crowned with frosted glass spheres that bloom as darkness falls over Australia’s spiritual heartland. Available daily from Uluru. Amandatory AU$25 National Park entry fee is payable locally. 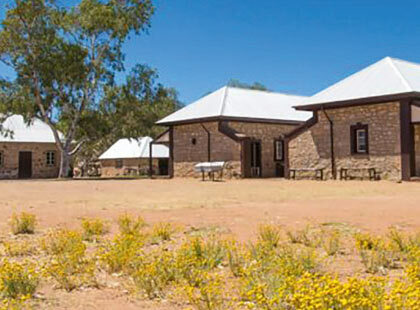 Stop at the historic Telegraph Station, which marks the original site of the first European settlement; visit the Royal Flying Doctor Service to learn how this marvellous facility operates; and, visit the School of the Air where you may be able to listen to the children take lessons over the air. At the Alice Springs Reptile Park see unique lizards and snakes before the tour concludes with panoramic views of Alice Springs and the MacDonnell Ranges from Anzac Hill. Available daily (Mar-Nov) and Mon, Thu & Sat (Dec-Feb) from Alice Springs. 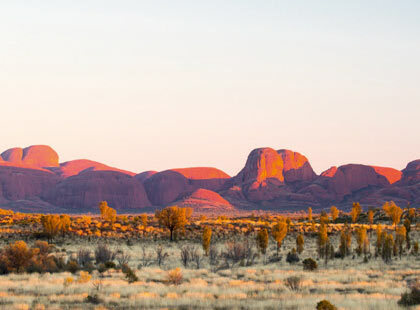 Rise early this morning to watch the first rays of the sun set the Red Centre alight, then travel to the mystical domes of Kata Tjuta. 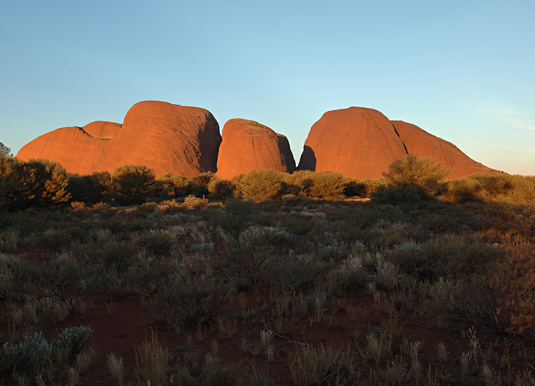 En route, enjoy panoramic views of the southern side of Kata Tjuta, before arriving at the base of Walpa Gorge. Spend some time exploring the gorge and the unusual conglomerate rock formations. 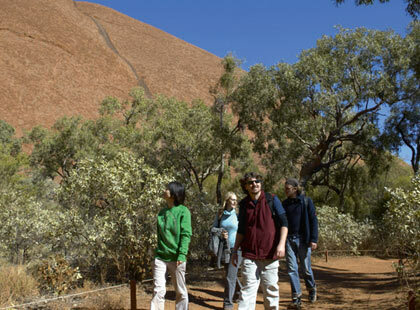 The walking trail through Walpa Gorge follows the natural creek between two of the tallest domes of Kata Tjuta. 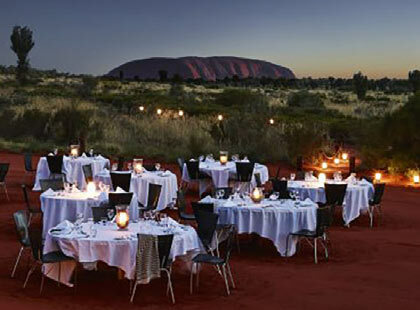 Availabledaily from Uluru. Amandatory AU$25 National Park entry fee is payable locally. 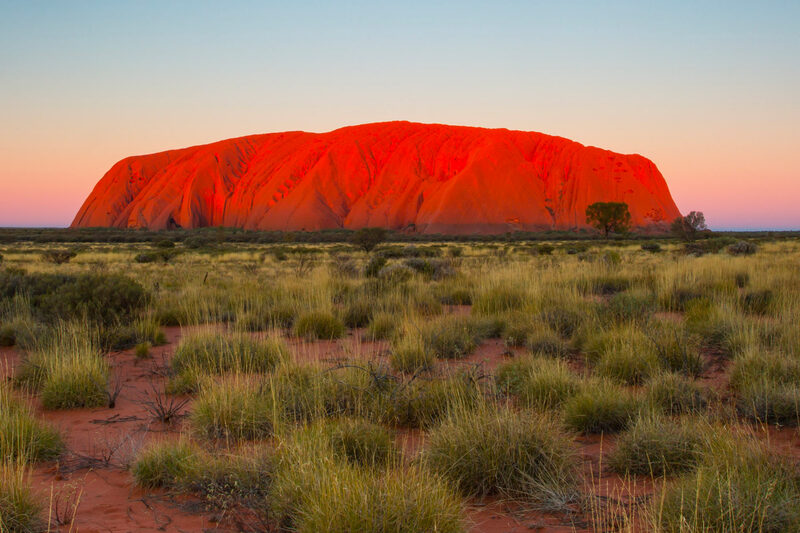 Rise early to travel to the base of Uluru where you have breakfast and then commence your guided base walk as sunrise approaches, walking from Kuniya Piti, a sacred site at Uluru. Next up is the Mala Walk, with a visit in to Kantju Gorge, followed by the Lungkata Walk and Mutitjulu Waterhole. 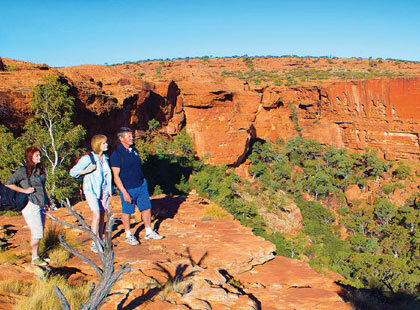 Your guide will indicate the natural features of the landscape, Aboriginal rock art and relay traditional stories. Availabledaily from Uluru. Amandatory AU$25 National Park entry fee is payable locally. On this 4WD safari travel down the bed of the Finke River, one of the oldest watercourses in the world, into Palm Valley. See spectacular rock forms, white sands and an oasis of rock pools and palm trees, then visit the spectacular rock formation known as the Amphitheatre. On the return journey to Alice Springs watch the changing colours of the magnificent West MacDonnell Ranges in the afternoon sunlight. Available Mon, Wed, Thu, Sat & Sun (Mar- Sep) from Alice Springs. An unforgettable evening tour, which begins with an uninterrupted, three hundred and sixty degree view of this vast landscape. Ahead of you is the fabled Uluru; behind you are the domes of Kata Tjuta and, possibly the most spectacular sunset you will ever see. After a gourmet barbecue buffet, enjoy stargazing as the resident astronomer takes you on an unforgettable tour of the southern night sky. Available daily from Uluru. Amandatory AU$25 National Park entry fee is payable locally. Travel to King’s Canyon, stopping en route for breakfast. 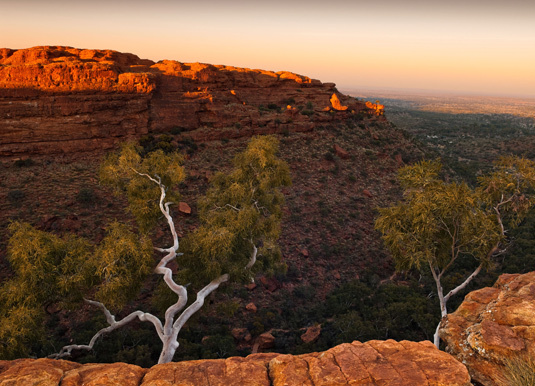 Climb to the rim of the canyon for marvellous views of Watarrka National Park, then follow the rim stopping at look-out points. Time permitting, you may choose to descend into the green oasis of the ‘Garden of Eden’. The circuit walk takes approximately 3 hours to complete, is rocky and steep in parts and is recommended for those with a good level of fitness. An easier, shorter walk to explore the boulder strewn canyon floor is available. Available daily from Uluru. Pre-dawn transfer to the launch site and the ascent starts just as the morning light illuminates the rugged MacDonnell Ranges. 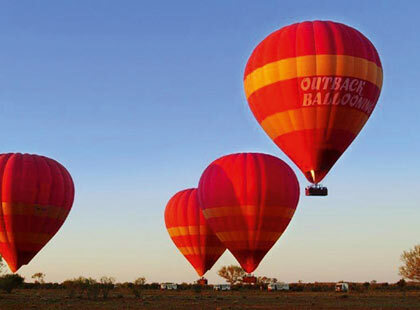 Float gently across the vast expanse of the Central Australian outback, keeping your eyes peeled for wildlife, particularly big red kangaroos. After landing enjoy light refreshments including a glass of sparkling wine before returning to your hotel. Minimum 6 years. Available daily from Alice Springs. 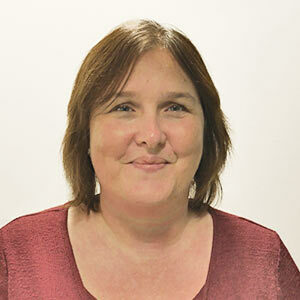 An AU$30 insurance fee is payable locally. A 60minute flight is also available. Please ask for details. Enjoy the spectacular sights within the Uluru-Kata Tjuta National Park in all their natural beauty during this exhilarating experience. 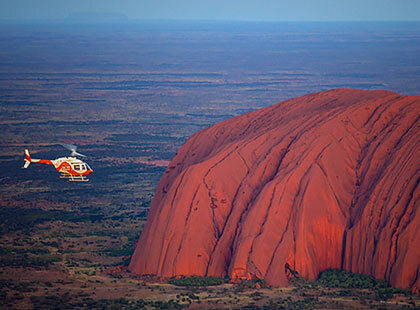 Board your helicopter for a 30 minute scenic flight around Uluru and Kata Tjuta (The Olgas), also taking in the surrounding Musgrave Ranges and possibly a camel or two. The tour concludes with a return transfer to your hotel. Available daily from Uluru. Amandatory AU$25 National Park entry fee is payable locally.